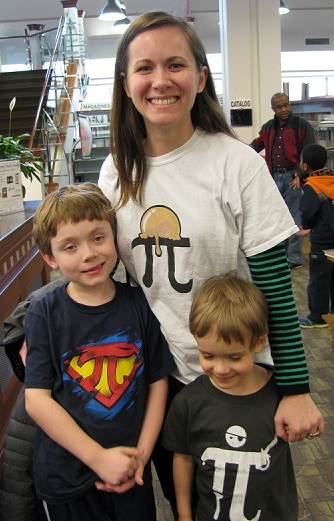 Today was Super Pi Day! 3.14.15, celebrated especially between 9:26:53 am and 9:26:53 pm. I got my geek on, with my Floating Point Pi Earrings from ThinkGeek, my Pi t-shirt from the Mathematikum in Giessen, Germany, Apple Pi socks, and of course my Prime Factorization Cardigan. I also brought in a Chocolate Angel Pi Pie. 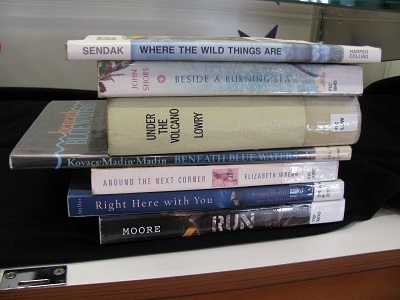 My favorite comment was when I was explaining all this to one of the Library Friends. She said, “It’s good to see someone who loves what they do.” My translation: “You really are a Math Geek.” Yes, I am. Yes, I am. 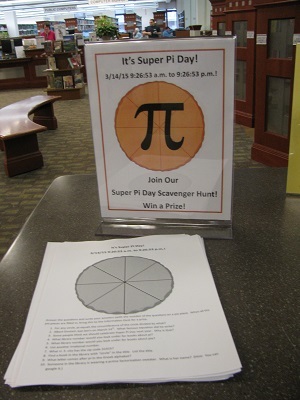 Since a Children’s Used Book Sale was going on all day, we couldn’t use the meeting room, and decided to run an all-day Pi Day Scavenger Hunt. 1. 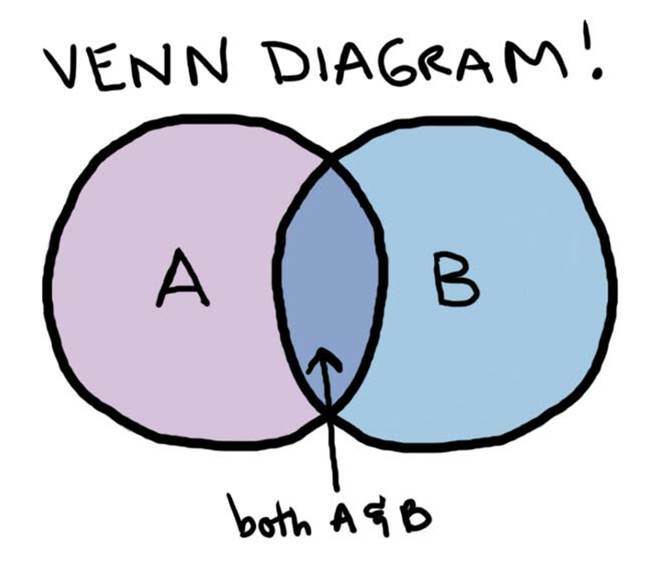 For any circle, pi equals the circumference of the circle divided by what? 2. Albert Einstein was born on March 14th. What famous equation did he write? 3. 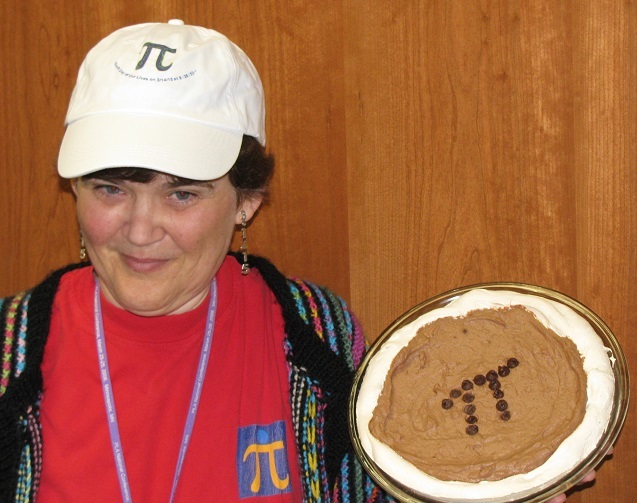 Some people think we should celebrate Super Pi Day next year. Why is that? 4. 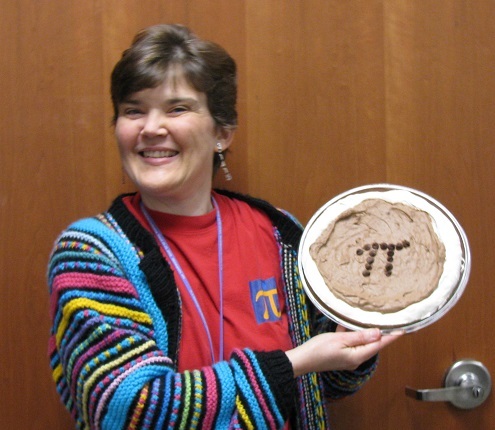 What library number would you look under for books about pi? 5. What library number would you look under for books about pie? 6. List another irrational number. 7. What U.S. city has the zip code 31415? 8. 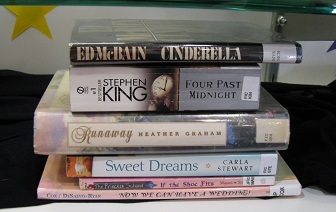 Find a book in the library with “circle” in the title. List the title. 9. 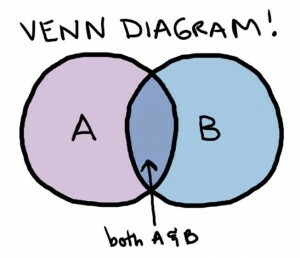 What letter comes after pi in the Greek alphabet? The prize was a wristband from thepidayofourlives.homestead.com celebrating Pi Day, along with some circular candies. Response was wonderful! By the end of the day, we’d given out 56 wristbands! I loved watching the kids working to figure out the answers. And I’ve never gotten the chance to talk to so many people about my prime factorization sweater all on the same day! But overall, it was simply a huge success! 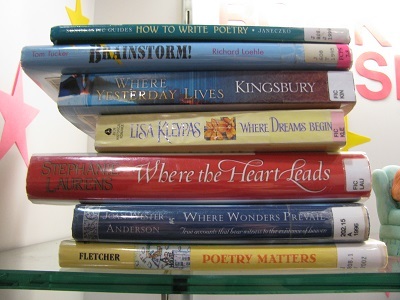 This month, the person who had reserved the display case had to cancel, so my co-worker Lynne Imre used an idea that Suzanne Levy had suggested from seeing Travis Jonker’s 100 Scope Notes blog: Book Spine Poetry! You Can Do Anything, Daddy! Here’s another poem I wrote, feeling a little cynical — but it ends happy! Now We Can Have a Wedding! What’s the Big Idea, Molly? And here’s one by Lisa Treichler. It’s a conversation, so I’ll use italics for the second speaker. I Don’t Want to Go to Bed! These are such fun once you get started! 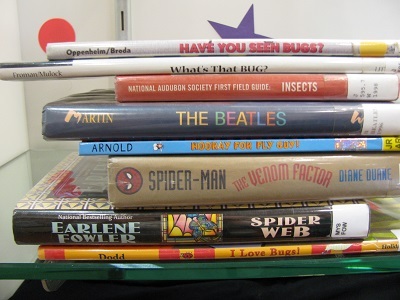 We are hoping some library patrons will catch the bug and write some more poems for us to display. Come to City of Fairfax Regional Library and write your own! The Carnegie Corporation has a wonderful article on their site, “Today’s Public Libraries: Public Places of Excellence, Education, and Innovation.” This picture was taken at one of the libraries in my own system. The second reason libraries persist is the notion of improvement, something that has been an article of faith among librarians and their civic backers for as long as there have been libraries in this country. We Americans were early proponents of universal education and individual initiative, and we long ago recognized the importance of giving people a chance to make their lives better by gaining knowledge and cultivating their minds—in other words, improving themselves both materially and intellectually. It’s an idea redolent of Ben Franklin and Samuel Smiles, Horatio Alger and even Dale Carnegie. 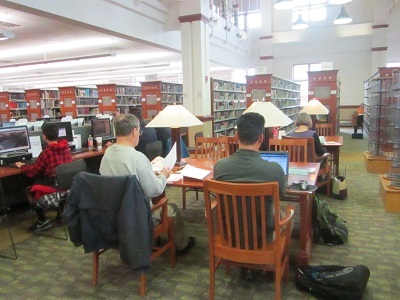 Visiting the Flushing library helped me realize that libraries persist because the marketplace, with all its many splendors, provides no good alternative to these comforting institutions where you can sit and think without a penny in your pocket. Libraries also persist because the idea of improvement persists—and because libraries continue to meet the needs of their patrons, perhaps even better than they have in the past. Library layouts have been evolving in recent years to accommodate different groups of patrons—just as they did years ago, to accommodate children. Librarians also have more training nowadays, not just in using computers but in communicating with patrons. And they are using the tools of the digital revolution—the very ones that were supposed to make librarians obsolete—to do a better job for the public, for example by promoting community discussions online, offering help on the Web and using Twitter to keep patrons informed. In New York City, in Chicago, in Los Angeles and so many other places that are magnets for immigrants, libraries provide reading material in a host of tongues, not to mention instruction in the English language and workshops on how to become a citizen. They still provide books, of course, but they also provide Internet access for those who lack a connection, a computer or even a home. In smaller communities, they remain cherished civic and cultural spaces, anchoring sometimes tattered main streets and serving as a destination for children after school and the elderly after a lifetime of work. This idea of improvement—of helping people to make their lives better through knowledge, just as Andrew Carnegie sought to do through his vast international library-building program—is what ties together all the things libraries do today. Yet even with the Internet at their fingertips, Americans still need—and want—their public libraries, even if only as a place to access the Internet. Most of us, though, want and expect much more from our libraries, and that’s reflected in every measure of public attitudes toward them. Consider that homes near libraries sell for higher prices. 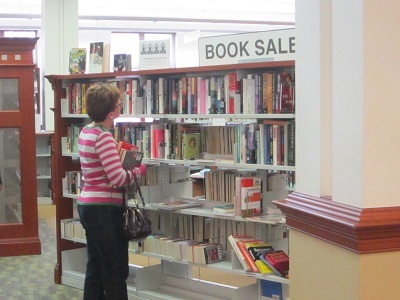 Two-thirds of American adults say they visit a library at least once annually. Last year voters approved a remarkable 87 percent of library operating ballot measures, suggesting that taxpayers overwhelmingly believe they are getting their money’s worth from these venerable and much-loved institutions. Instead, librarians can focus on their unique capabilities as repositories, organizers and guides to knowledge. They can provide a focal point for their communities, as well as a necessary refuge. And they can carry forward the faith in improvement that has sustained them all along. By upholding their great tradition of public service, libraries will continue to win public support—and, it is hoped, public dollars. It’s a great bargain for society, and one likely to keep libraries in business long into the digital future. The whole article is excellent, talking about the same thing I’m trying to emphasize here — how many different ways libraries and librarians help their communities. And it’s been awhile since I posted about the things I’ve gotten to do myself. 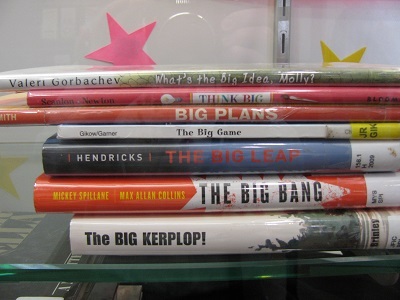 A big summer theme is parents or grandparents coming in, looking for books to tempt their children, with the children along. That’s one of my favorite questions, and I usually offer them several choices. I love when a child’s eyes light up with interest. One little boy said, “That looks interesting!” when I showed him the book The Polar Bear Scientist. I found him some fiction and nonfiction that he found appealing. I always like to stress to kids that they are allowed to stop reading if they don’t like it. I try to give them several possibilities, in hopes that something will spark their interest. That won’t work if they feel obligated to read my suggestions all the way to the end. Summer reading should be non-required reading, and a big huge part of summer fun. I’m a lot more frustrated with parents who come in with lists or who only want books from a list. In the first place, parents in the same area use the same lists, and they tend to be checked out. (Put them on hold from home if you just want those particular books!) But when the parents are willing to talk to me and get similar suggestions, when they have a little flexibility, and especially when they bring their kids, then we can find some wonderful choices. Also this month, one of my co-workers put on a “Book Bingo” program that was a big hit. They play bingo with a modified card (using book titles), and the prizes are — books. We use gently used donations that the system doesn’t need. Some are wrapped, and there are opportunities to exchange for a title a child wants. What I love about it is how enthusiastic the kids were and how excited about their winnings. It’s a super simple program, but what a great way to get kids excited about reading. But my favorite question of the last month or so was the guy who walked nervously up to the information desk and asked, “Where’s the nearest exit?” Now, mind you, we have one main entrance and exit to the library, and it’s quite obvious from the information desk. He got me wondering if there was a specific reason he wanted the nearest exit, and I evaluated whether the nearest emergency exit was nearer than the main entrance. I decided it wasn’t and pointed him to the big doors through which he must have entered the library in the first place. Did he know something I didn’t know? I have to admit, I was relieved when no alarm went off in the next five minutes. Spread the word — Librarians Help! Disclaimer: The views expressed here are entirely my own and do not in any way reflect those of my employer. It’s been more than a month since my last Librarians Help! post. During that time, I went to ALA Annual Conference. What did I learn there? More ways to help, of course! — Help parents build early literacy skills in their little ones. — Help older kids learn to read. — Help show kids the fun side of reading. — Provide a place to come in from the heat. — Provide conversation about technology and privacy and ethical use of technology. — Provide exposure to technology. — Show how to use technology to promote learning. 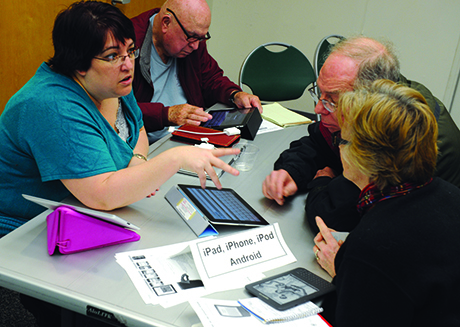 — Help people trace genealogy. — Help people find their next book to read. — And, of course, promote great books by giving prestigious awards. I’ve got notes from some of the people I helped before I went to California for the conference (and vacation with family and friends), so I’ll post a few of those. — Got out some old photos of a local high school from the rare book room. — Ordered microfilm from the Library of Virginia. — Figured out the title of a book from a fragment on one copied page. — Answered the question: What were the top three companies (by any criteria) in 1939? — Helped someone copy a pdf file on the public computers. 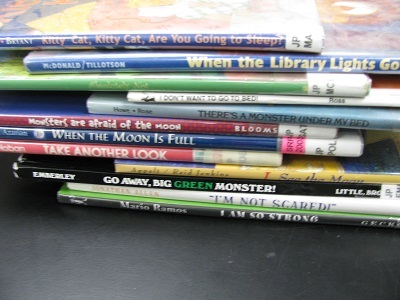 — Helped someone load library books onto their Nook. — Helped a customer format her resume. — Answered question about salaries of congressional staff. — Provided a definition of “cognitive dissonance” over the phone. Have I convinced you yet? Librarians Help! Librarians Help! – Book! Book! Book! It’s been a couple weeks since I did my last Librarians Help! feature. 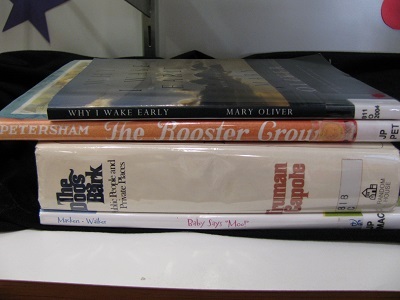 I chose the title because of my very favorite incident in the library this week. A mother was walking into the library with her toddler son in tow. 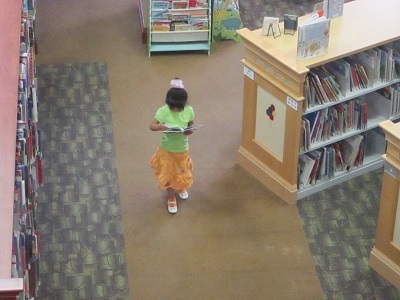 Now, from a toddler’s eye level, there’s not a whole lot going on at the entrance to the library. The shelves aren’t facing out, and mostly what he’d see are desks. But we do have two book displays just before you get to the information desk, and one of those I had just stocked with children’s nonfiction, trying to put the simplest books on the lowest level. 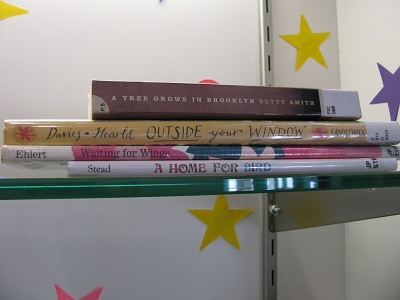 I didn’t notice the mother until she passed the children’s books display on her way to the nonfiction. I heard, “Book! Book! 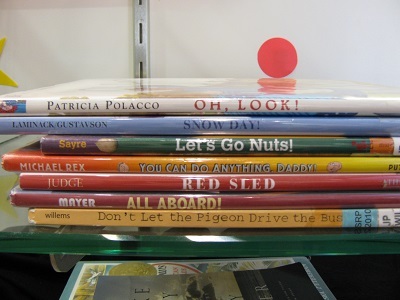 Book!” Mom had already passed them on her way to the nonfiction, but the son was holding back, pointing happily at the books on the display. I knew there was a family that used the library often and a little boy who already knew that books are objects of delight. 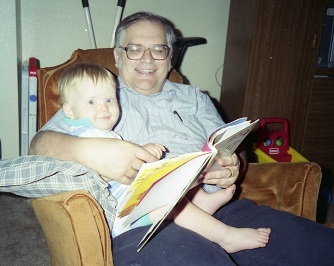 I don’t have a picture of that incident, but thought this was a good excuse to insert a picture of my Dad reading to my son, many years ago. What’s better than helping make books objects of delight? I really wish I had found Eating Fractions, by Bruce McMillan. She did have a list of several books, we found several on the shelf, and I showed her those ones I knew about. Those kids are in for a treat! One more thing I want to do with this Librarians Help! 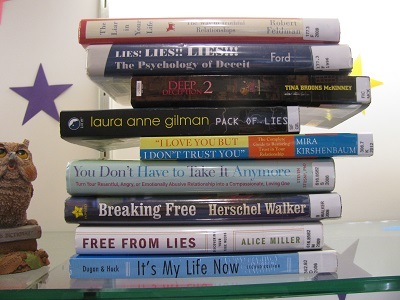 series is provide a link about other librarians helping. 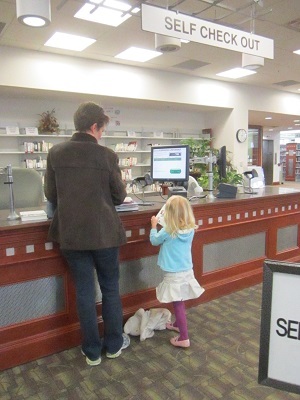 This link provides statistics from Snapshot Virginia Day, when we counted the basic ways the Fairfax County Library helped people. For example, more than 16,000 people visited our branches that day. Librarians answered more than 1,700 reference questions. We offered 13 programs or classes that day that were attended by 385 people. What’s more, that was a Saturday, when our hours aren’t as long as other days and our staffing is not as good. Spread the word: Librarians Help! Didn’t I Say That Would Happen? Last week, I posted about the Digital Divide and how I think that will affect students in Fairfax County. This week, The Washington Post ran an article reporting that very thing is already happening. But questions remain about whether the least-privileged children will have equal access to required texts. Many don’t have computers at home, or reliable Internet service, and the school system is not giving a laptop or e-reader to every student. A survey of the schools that piloted online books last year, including Glasgow, indicated that 8 percent of middle school students and 12 percent of high school students do not have a computer at home. On a recent day at the Woodrow Wilson Library in Falls Church, she signed up for a terminal and dived into her homework — several pages of questions about the Reconstruction period after the Civil War that required visiting a particular Web site. She finished more than half of the questions before the library closed at 6 p.m. The article links to an earlier article that expressed how difficult it was — even before textbooks were online — to get enough computer access to do homework. It frustrates me that this is the same county that drastically reduced library hours. I have no doubt that a large proportion of middle school and high school students who don’t have a computer at home also may not have a parent at home until after 6:00 — when their local library hours have been cut. At Glasgow, which is in the Alexandria portion of Fairfax County and where about 62?percent of students qualify for free or reduced-price lunches, Principal Deirdre Lavery has extended after-school computer lab hours and developed a way for students to check out laptops overnight. Other schools are making similar adjustments. Now, for me, I’m relieved that even though he has his own computer, my son is a Senior. And AP Social Studies textbooks are not yet online. Aside from all the other issues, I don’t really want him reading from a computer screen that much more in a day. He already wears glasses. 1. It seems to me that Fairfax County decision makers need to think much harder about the kids who aren’t getting a fair shake out of this situation. You’ve just made their lives that much more difficult. 2. Please acknowledge that now the libraries in the county are more important than ever. The library hours and funding should be restored, because now more children than ever before need the library just to do their homework. I came across this outstanding article about the Digital Divide the other day. I forget who posted it first on Twitter, but thank you very much! Seanan McGuire is the blog author. Strongly put, you say? The writer definitely backs up her point and tells us why personal experience causes her to react this way. Now, this is the same county that has drastically cut library hours. I know for certain that lots of kids get their only Internet access at the library, and that their local branch is not open every night after school. Now they can’t even read their textbooks without a computer? “Some people have proposed a free reader program aimed at low-income families, to try to get the technology out there. Unfortunately, this doesn’t account for the secondary costs. Can you guarantee reliable internet? Can you find a way to let people afford what will always be, essentially, brand new books, rather that second- or even third-hand books, reduced in price after being worn to the point of nearly falling apart? And can you find a way to completely destroy—I mean, destroy—the resale market for those devices? My co-worker’s reaction to the school’s announcement was that this will make the gap wider between the Haves and the Have-Nots. And she hadn’t even read this article! I hope the leaders of Fairfax County will think hard about the Digital Divide when they contemplate “the wave of the future” and keep from turning it into a tsunami for the many, many people in this county living in poverty. “Libraries are losing funding by the day. Schools are having their budgets slashed. Poor kids are getting poorer, and if we don’t make those books available to them now, they won’t know to want them tomorrow. “We cannot forget the digital divide. And we can’t—we just can’t—be so excited over something new and shiny that we walk away and knowingly leave people on the other side. On Saturday night, I posted about the frightful (in more ways than one) Wall Street Journal article that was creating a stir by saying Young Adult books have gotten horribly dark and subversive. The response on Twitter was beautiful with people tweeting about how dark and light YA books have enhanced and even saved their lives, using the hashtag #YAsaves. First, I loved Cecil Castellucci’s article on the Los Angeles Review of Books blog, “Better to Light a Candle Than to Curse the Darkness.” One thing I loved about this blog post was that it gave me a new motto: “Putting the right book in the right kid’s hands is kind of like giving that kid superpowers.” Yes! I recently stood slack-jawed in the adult fiction section of my local big box book store, having decided that supporting my community while getting personalized recommendations by professionals who generally adore books and make it their business to know exactly what sorts of things a reader will love was just not on my to-do list this year, feeling stupefied and helpless. Of course, it’s a little ironic that even as I’m defending dark books, I stopped listening to an adult book on CD because it was too dark for me. But I simply wasn’t in the mood for it today. And the difference is that I understand that the particular book I stopped listening to is considered great literature by many, and is a popular book club choice. I’m fine with that. I tend to like lighter books, but that’s exactly how I knew that the mother in the Wall Street Journal article would have been able to find all kinds of great, current, light, uplifting, well-written books for teens if she had only gone to a library and consulted with a professional. You are currently browsing the archives for the Library Links category.